Lion Bud is a charter member of the club and has served in all club offices. He was club Secretary/Treasurer for five years and received two 100% Secretary awards. The club recognized him as "Lion of the Year" for 1976-77. He has received two club Presidential awards, the Guiding Lion award and the International Extension award. 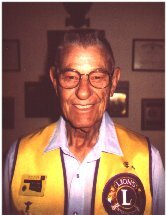 While editor of the club newsletter, along with his wife Betty, "The Lions Pride" was awarded second place for three consecutive years. He has served as Deputy District Governor, Zone Chairman, District Sight and White Cane Chairman. Lion Bud served in the Army for 26 years, retiring as a Sergeant Major at Fort Sill in 1975. He recently retired after 16 years with TELOS.